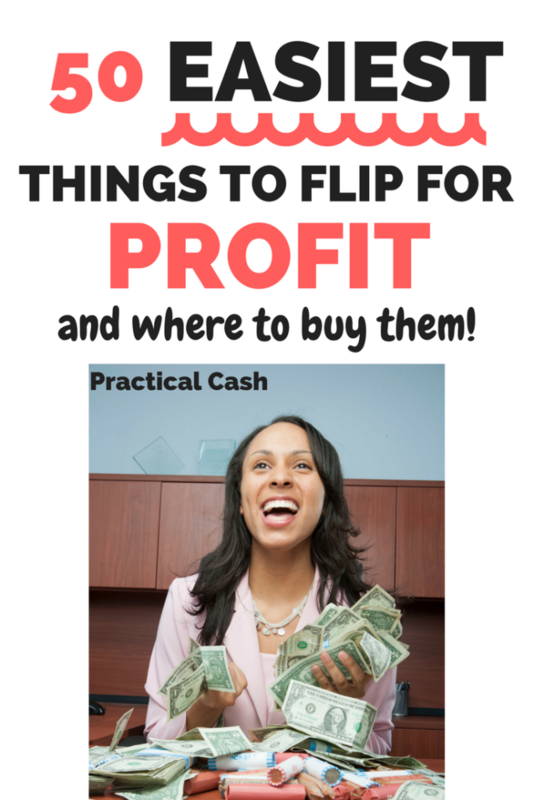 Are you looking to earn extra income by selling the easiest things to flip for profit? Or are you yearning to quit your day job and work for yourself by making flipping money? Making flipping money by selling online is easier than ever. Today there are more platforms to sell on, more money making apps to use to price and sell your items, and more places to purchase items to flip. In 2017, I made over $5,000 per month flipping items for money. It was the perfect job for a mom or anyone who needs a flexible schedule. You can even do most of the work at home. 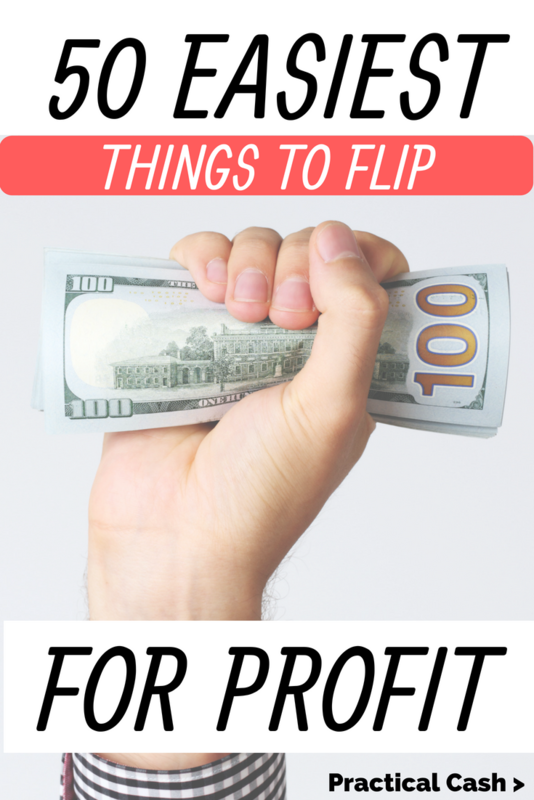 Along with running this blog, finding easy things to flip to make money is what I do to support my family. And you can, too! 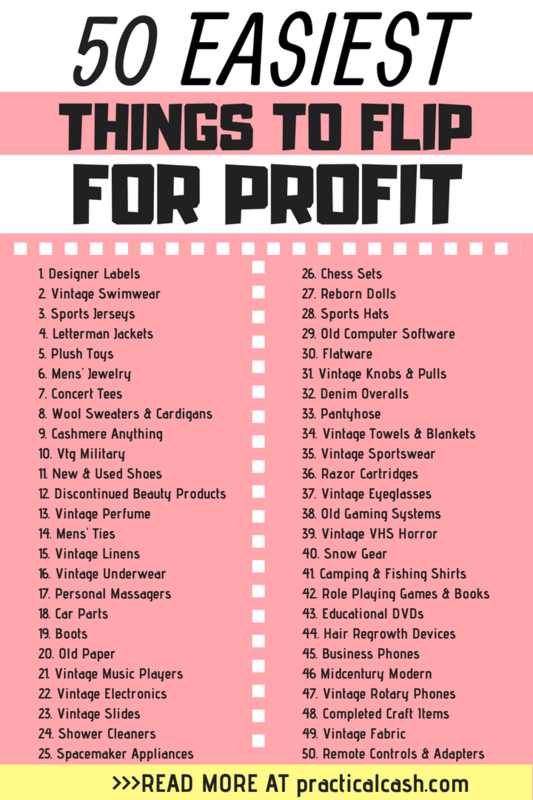 If you’ve never flipped items for money before, you’re probably wondering how to get started and where to begin. First, set a flipping budget you’re willing to spend on inventory. You can get started with as little as $20. Want more thrift store shopping tips? Check out 13 Shopping Hacks for the Best Thrift Store Finds. When buying items to flip for profit, you want to buy low and sell high to get the most profit. That means you have to know approximately how much you can sell your item for on Ebay, Poshmark, Amazon, or Craigslist. Most selling platforms allow you to search and look for similar items they’re selling. Look at the “Sold” or “Completed” listings to get an accurate picture of what the items actually sold for. Pick a money making app you want to use to sell the easiest things to flip for profit. Download the app, enter your personal info and payment information (how you will get the money into your bank account or Paypal). Take photos of your items. Use your smartphone or digital camera to take clear photos of your items, preferably at least 5-6 photos for each item. You don’t have to have a professional backdrop but choose a neutral background. Wood floors, brick walls, or plain colored walls make good backdrops for selling apps that let you sell online fast. Take photos in bright daylight or outdoors or direct a lamp with a CFL or LED bulb toward the item to show more detail. Take photos of each side of your item, from above, and underneath. You want the customer to understand the condition of the item from the photos alone. List your item. Included information about whether the item is new or used. Provide details about the size of the item. If you are listing a shirt or top or jacket, lay the item on the ground and measure the distance from armpit to armpit and from the shoulder to the hem. If you are listing a skirt or pair of pants, measure the inseam (from crotch to cuff) and the waist from side to side. Include those details and measurements in your listing. Answer questions about your item, if the buyer has them. Get some flipping shipping supplies. At the minimum, you will need some packing tape (this is my favorite kind on Amazon). I also package my items in clear plastic bags called polybags. These are the ones I buy on Amazon. I find they’re a great buy since they have a variety of sizes in one package. Get yourself a tape gun and some bubble mailers or boxes, and you’re ready to ship. Once the item sells, neatly package the item and ship it to the buyer. Most apps will let you buy postage online and then print it from a home computer. You want to earn an extra $500, $100, or even $5,000 a month. You have some debt you want to pay off or a vacation you want to take. You want to control your own hours or do something part-time. You want to start a business from home but don’t know how to get started. You want to make sure you turn a profit IMMEDIATELY. As a pro flipper what I love about this course is that it’s a true shortcut to the info you need. I’m not going to lie, you will need to WORK because you’ll be running a business – but these guys teach all about the details that can trip newbies up when they’re starting a reselling business. If you need someone to TEACH you how to sell stuff for cash, check out Rob & Melissa's course Flipper University by clicking here. Modern and vintage designer labels are one of the easiest things you can flip for profit. You can often find designer label items nestled among the racks of a regular thrift store. Hermes, Chanel, Fendi, Coach – plus more modern designer labels from Anthropologie and Nordstrom – all sell well on Ebay, Poshmark, and other selling sites. Both men’s and women’s designer labels sell extremely well in general. Vintage swimwear is a hot seller, from mid-century to the 90s. Look for skirted suits, vintage swim caps, and men’s trunks. Before purchasing swimwear to flip, check the garment to make sure that seams aren’t sagging or stained. Vintage and modern sports jerseys make great flipping money, especially if the team or playing is in the playoffs or having a great year. If the jersey is stained, an overnight soak in Oxi-Clean can bring you more profit from flipping. Stuffed animals, stuffies, plush toys are more than for little kids – they can bring some serious cash. Lots of people collect high dollar plush, and they’re willing to buy it from you for money. Many people want to relive the memories and feelings of their childhood. Everyone had plentiful plush in their kid bedrooms. Maybe the plush you loved kept you company after school. Maybe a beloved grandparent gifted you a stuffed animal you lost somewhere along the way. Or maybe you just loved that stuffy because it’s a remembrance of a simpler time. Plush is often valuable because people want to reclaim their childhoods. For more info on flipping plush as a quick way to make money, check out: I Made $1200 Last Year Selling Plush and Used Stuffed Animals. Make money flipping new and vintage concert t-shirts for cash – one of the easiest things to flip for profit. Even vintage concert tees with stains and holes often sell for profit because fans can’t get them anymore. Current bands may sell for less, but still a quick $20 in your pocket is a great profit. Wool is classic and warm, and 100% wool, lambswool, alpaca, and mohair sweaters have significant resale value. In some cases, even damaged sweaters can be flipped for profit. Look for grandpa and Mr. Rogers type sweaters, as well as Nordic, Irish, and fisherman style chunky knits. Like 100% wool, 100% cashmere items are a quick flip for profit. Crafters even use damaged cashmere sweaters to upcycle into new items. Whether it’s a scarf, sweater, or cardigan, you can easily flip cashmere into cash. Shoes, both used and new, are a staple of easy flipping income. Look for designer brands, newer athletic shoes in good condition, unique women’s vintage shoes, men’s dress shoes in good condition, water/hiking shoes, and vintage Converse and Vans. Women depend on their beauty products, so when companies discontinue manufacturing a staple item, the price often rises sharply on Ebay and Poshmark. Discontinued beauty items to keep an eye out for include shampoos, lotions, lipstick shades, and foundations. If the item is opened, you do need to check for any funky smells that mean the ingredients have spoiled or separated. Estate sale bathrooms are a great place to check for vintage and discontinued beauty products. Like beauty products, vintage perfumes are another easy flip for profit. You can even sell open and partially used bottles (just be sure to disclose that in your listing). When shipping vintage perfume to a buyer, be sure to choose a ground shipping method and pack well. Designer men’s ties are cheap to source, easy to ship, and often bring great flipping money profit. Brands like Brioni and Hermes and vintage skinny wool ties sell extremely well, as do Donald Trump silk ties. When sourcing high end men’s ties, check carefully for stains and holes. Vintage linens such as napkins, tablecloths, and bed linens are an easy flip for money, even if they are in less than perfect condition. Be on the lookout (BOLO) for: vintage Disney bedsheets, Irish linen napkin sets, Pottery Barn pillow covers and sheet sets for adults and kids, and Ikea linens. Old handmade quilts for kids or adults also sell for great profit. Here’s a weird one – new in package, deadstock underwear and socks sell for BIG money! You can’t resell used underwear and socks on Ebay but you can sell items new in the package. Vintage underwear items are one of the easiest things to sell for money. New in box or even used vibrating massagers sell quickly and for significant profit, especially those with features like extendible handles and heat. Panasonic is one brand to look for and is one of the easiest things to flip for profit. Be careful how you title your listing, for although you can list “neck” massagers in with general merchandise, some personal massager listings will be removed and you will be instructed to put them in the adult category. You might have known you could sell a car on Ebay, but all kinds of car parts are hot sellers, too. If you have a local U-Pick car parts lot where you pay for auto parts by the pound nearby, you could pull off glove box and trunk latches, list them online, and flip for easy profit. Selling snow boots, hiking boots, riding boots, motorcycle boots, and cowboy boots are a quick way to make money online anyone can do. Before you buy something to resell, make sure you test the soles by bending them to make sure they don’t have dry rot. Paper is hot! People want to remember the good ol’ days of cross country trips, eating at diners and fine restaurants, and paging through old magazines. Vintage magazines, especially when multiple issues are lot together, often sell well (some people purchase them just for the advertisements). Menus for restaurants that no longer exist and old gas station maps are sought after for their graphic design. For flippers, old paper ephemera can often be purchased for cheap. Smartphones have largely replaced stand-alone music players today, but lots of people still want to use an old iPod or Zune. If you can charge and test the item before listing it for sale, you’ll get a better price but even old music players with cracked screens are worth something, especially if they contain a large library of songs. Still have all your cassette tapes from your teen years and find yourself longing to play them? The market for vintage electronics is hot. You can make some quick flipping money on vintage cassette decks, VCRs, mini-disc players, 500-disc CD players, TV/VCR combos, and DVD/VCR combos. If you happen to find Walkmans or other vintage electronics new in the package, these items command an even higher price. A few years ago, Scrubbing Bubbles came out with an automatic Shower Cleaner that sprayed your shower down with cleaner at regular intervals. But shortly thereafter, they discontinued manufacturing it. The customers who’d come to depend on the Scrubbing Bubbles Automatic Shower Cleaners will pay big money if you find one of these and resell it. Especially be on the lookout for ones that are new in the box or the sealed cleaning fluid cartridges that go in the dispenser. General Electric Spacemaker appliances – including coffeepots, radios, CD players, and can openers – are a great easy flip for profit and easy to find at yard and garage sales. You can play chess online for free these days, but chess lovers still enjoy the physical moving of pieces. Look for DGT, Excalibur, Novag, and Kasparov electronic chess sets to resell. Do a quick check to make sure all pieces are included before purchasing. Reborn dolls are lifelike silicone dolls and command a high price in resale markets. A lot of workmanship and skill goes into the creation of a reborn doll, so they’re easy to profit from if you can find one at a good price. Hats are easy to come by at thrift stores and garage sales, and depending on the ones you find, they can be quite profitable. Look for wool and trapper hats, unique fishing hats, sports team hats, and hats for popular bands. Have you ever upgraded your computer and realized that you needed data from a program that you no longer had access to? Every day, individuals and businesses have computer crashes, IRS audits, and other situations that require they use older computer software – and without people who find easy things to flip for profit, they’d be out of luck. Old Apple products, vintage clicky keyboards, old PC programs and manuals, and Mac accessories are all profitable items to flip and readily available at secondhand stores and rummage sales. Grandma’s hosting Thanksgiving dinner this year, but she realized she’s missing a few forks – you get to be the hero when you resell flatware for flipping money. Flatware, silver plated ware, and even sterling silver pieces can be sold for profit to make money online. Look for the manufacturer of the flatware. You might have to do some research to identify the pattern but if you email them a picture of the pattern, manufacturers are often willing to ID the pattern for you. DIY is hot, and vintage hardware such as vintage knobs and cabinet pulls bring awesome profit if you can find them. Denim overalls – full length and shortie varieties – make serious flipping money and are easy to pick up for cheap. Men’s and women’s jean overalls sell well. Old pantyhose – new in package and even pairs with runs and holes – are one of the easiest things to flip for money when grouped into large lots. Do you have vintage towel sets, dish towels, or wool blankets? Vintage towels and blankets are an easy flip for profit. TV and movie set dressers often purchase these items to use as period props on a production. Look for older Nike, Adidas, Champion, Polo, Tommy Hilfiger, and other sportswear brands. Keep an eye out for nylon jackets with big spell-out logos – easy flips for fast cash! Estate sales can be a goldmine for old razor cartridges stuffed in a drawer. Razor cartridges for both men’s and women’s razors command cash and are easy to ship. Of course more recent game systems hold value and can bring you profit. But even older, outdated systems such as Sega Genesis, Nintendo 64, and Playstation 1 are easy to find at garage sales and desired by collectors. Horror film buffs will pay up for vintage VHS horror films that were never released to DVD. Do a visual check of the tape to be sure that mold hasn’t sprouted inside the case. 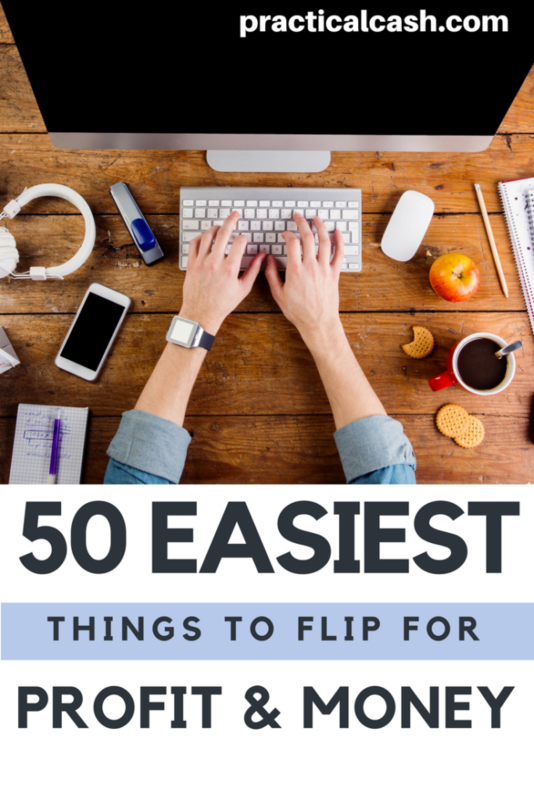 One of the easiest things to flip for money! Outfitting yourself for skiing or snowboarding gets expensive, so there’s a robust resale market for snow gear. Look for full length snow bibs/overall, zip out jackets, and snow pants in larger sizes. Keep an eye out for vintage Dungeons & Dragons books, manuals, and dice. Consumers will spend serious cash on DVD sets for business, education, or other classes, but once they’ve consumed the materials, they end up in yard sales or at thrift stores. Educational DVD sets are an easy thing to flip for profit. People who deal with thinning hair and baldness are willing to pay big bucks for solutions that work. Hair regrowth therapies and medications sell quickly for good flipping money. You can find large lots of business phones in the business section of Craigslist. Look up the phone brand and model to see if there’s profit in it. Midcentury design (from the 1950s and 1960s) is super hot right now. Look for home accessories, décor, and kitchen ware with starbursts and atomic themes. Large needlework pieces require hours of work to complete. People who love the look of needlework but don’t want to do the work themselves – or who just appreciate the handwork as art – are looking for completed cross stitch, embroidery, and crewel pieces so they’re one of the easiest things to flip for money. Remote controls for stereo equipment, car stereos, TVs and cable boxes, and Bose stereos all sell quickly. AC adapters for name brand laptops, breast pumps, and pet containment fences are also easy quick flips for money. I’ve given you all of my flipping secrets based on years of reselling items for profit. Let me know the easy things to flip for money you have found in the comments. I never would have thought of razor cartridges! Terry, I know, right? Best thing is you can find them cheap, usually. I’ve sold Lady Schick ones that I paid $.50 for – for $40. That’s a great ROI!